Gretchen and Elizabeth Huijskens join us to talk about Trades of Hope—a philanthropic party plan company they founded along with Holly Wehde and Chelsie Antos, to microfinance artisan co-ops operating in impoverished areas. Trades of Hope works with artisan partners around the world (who create jewelry, accessories, and home goods) and compassionate entrepreneurs (who sell those products to earn commissions and help those artisans elevate themselves and their families out of poverty). Gretchen and Elizabeth talk about their history, how they moved from charity work to business—from giving aid to creating opportunities that make a lasting impact—and they show their love for the direct selling and multilevel marketing industry that allowed them to turn a hope into a reality. Kenny: Hello and welcome to the MLM.com podcast. I’m your host, Kenny Rawlins. Today on the podcast, we are joined by Gretchen and Elizabeth Huijskens who are two of the founders of a unique direct sales company, Trades of Hope. 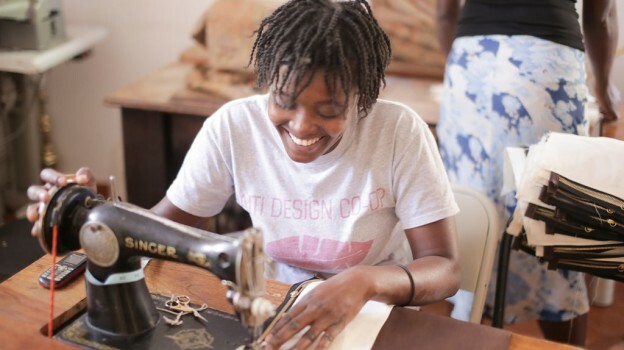 Trades of Hope is a unique party plan company that is using the direct sales model to allow artisans around the world to bring their products to a larger market. Elizabeth and Gretchen, thank you so much for joining us. How are you this morning? Gretchen: We are doing well. Thank you so much for having us. Kenny: It is really an honor to have you guys on. Trades of Hope is a very impressive company that I think is so unique because, in the MLM and party plan space, we are so used to seeing companies provide their distributors and consultants with a chance to empower their lives and change their lives through a business opportunity and meaningful products. But one of the things you guys are doing that is so unique is doing that kind of on both ends of the equation because your products are actually produced by your artisan partners. You’re giving people all around the world the chance to change their lives by producing products and then creating a marketplace for them to sell those. So, I wondered if maybe you could just give our listeners a little bit of background on how you guys came about this idea and what it is exactly that you are doing. Gretchen: Well, we kind of came at it a little bit backwards, I think, from most people who start party plan or direct sales companies. We had been involved in charity a long time—about eight years before the earthquake in Haiti—and just realized that there were a lot of shortcomings to charity. It wasn’t making the lasting effect that we had hoped to see in the community that we were working in. So, although there is a place for charity—and we very much encourage people to donate to charities as we do as well—that really should be saved more for natural disasters or things that need immediate response. But we are really interested more in long-term development and really look at our artisan partners now as dignified partnerships that we can have. So, we worked in the countries and we saw that they were making beautiful things. I really experienced firsthand that they were so incredibly capable. These people in underdeveloped countries, they’ve had to deal with way more than I have even fathomed of dealing with. They are resourceful and strong and would like to be independent just like the rest of us. And so, I was talking to a friend of mine, Holly about the idea of going more into microfinancing, starting small businesses with women, just really giving them opportunity to thrive and she was telling me that she had recently been at a party plan company party and she was thinking “Wow, what an amazing business model. Wouldn’t it be great if we could do this and somehow help people all over the world?” And really thought about empowerment in that way. So, we were just walking on the beach one day and I was just telling her kind of what I was thinking, she was just telling me kind of what she was thinking and we kind of looked at each other and thought, “Huh, maybe there is something interesting here.” And we called our daughters who were actually travelling in Italy at the time on a school trip and said “Hey we have this idea” to Elizabeth and Chelsey that we would love to do this, right? To partner with these artisans. And yeah, they were very excited about it and enthusiastic and that’s where their heart is too and so that was kind of the beginning of Trades of Hope. Kenny: Well, and I find that interesting. So, Gretchen you don’t come from a network marketing background, so, the direct sales approach was new to you, is that correct? Gretchen: Yes. Besides attending many parties, it was a new concept and as we began to research and explore, in the very beginning weeks, we just learned what a powerful tool it Is. That’s really how you can just reach the most people in all of these diverse areas. So, that was interesting and then shortly after we started Trades of Hope, a friend of mine told me—she is also in the direct sales world—she said, “you know that direct sales and social marketing was really a key element to women’s equality in the United States and that brought many more people into the workforce.” So, that was a fascinating idea too because that’s kind of when I started to realize how women here in the US and consultants in general, are empowered as well. So, it was really kind of this beautiful combination. Kenny: Yeah and that is one of the things that I think is so powerful about the direct selling space is that it has been a method or a means for people to really gain independence and anybody who has a desire and is willing to go out there and get after it can empower themselves and free themselves. But let’s talk a little bit more about your artisan partners. So, all of your products, as I understand it, come from people around the world who are artisan partners that are locally sourced. So, how is it that you get connected with these people who are producing these products? Elizabeth: Yeah, this is Elizabeth here. When we started in the beginning, we did some networking through some contacts that we had in Haiti—that we gained through our charity work there for about eight years—and heard that there were groups that were being started that were creating a product and then really just throwing it on social media—on Facebook—and selling it that way, on a very small scale. And of course, at that time… I remember, right before starting Trades of Hope, holding a bracelet from Uganda that was spun out of recycled magazines and the beads were all made out of recycled magazines and it was so cool. So, we heard and we learned more and more about groups and co-ops that were evolving all around the world. One of those first groups that we partnered with was through contacts that we had made in Haiti. And that’s kind of how we started, just reaching out through networking but very quickly groups started contacting us, hearing about what we were doing and saying “hey, I have this group of women and they really just need an opportunity to change their circumstances through the skills and the intelligent thoughts and ideas that they have and we would love to make our products for you.” From there we would figure out what their natural resources are in that country and what materials they could get consistently for us to sell a product and add it to our line. And today, we have an artisan application on our website which is very extensive to ensure that all of the groups and co-ops are safe and keeping the artisans future and health and really their dreams of where they want to go in life a priority. Because so much around the world that we buy is created in sweatshops or in slums and not paying people a fair wage. And they are toiling for basically nothing. and so we love that all of our products are made in safe working conditions. All of our artisans are earning a livable wage for their country and region. Now the word has spread through the grapevine and we have groups contacting us regularly to create products for us. Kenny: Yeah, and that is just amazing. With the internet, today, you can find products from all over the world and you really do wonder about what’s going on behind these products. How do I know that they are responsibly being made and that I’m not contributing to poor working conditions? And I think that with the bombardment of information and misinformation that we have in today’s world, that is one of the places that network marketing really shines. We have these connections throughout the world and a chance to really help one another and know that what we are doing is more responsible and socially responsible. So, I’m curious as you guys have been doing this, what effect are you seeing on your artisan partners? I know that you guys follow up with them. What is the impact that it’s having on their lives? Gretchen: Well we have seen women being able to step out of abusive home situations and some women have their own beds for the first time in their lives. women that are so happy they can put their kids in school. It is so funny because you see such a physical change. We have firsthand witnessed just some amazing stories where women have literally just come in off the streets. One woman, Gina, she had tried to find a place to give her baby away to, Chrisnelli. She was just really desperate and Gina, herself was really thin and not well kept and you could just tell her heart was hurting and she was feeling very desperate. So, one of our artisan group leaders had met her and found her and brought her into the co-op and Gina started to work the next day and then Chrisnelli could be in the daycare. And we happened to be there visiting that first day that they had started and it was just such a sad situation. When we went back the next year, and someone said “oh there’s Gina,” and I really thought they were just totally wrong, like “well that’s not Gina.” I mean this woman looked ten years younger. She had gained weight. She was giggling. She was just a completely different person and the joy radiating out of her was so obvious. So, that was a really concrete example that we got to experience. Through Trades of Hope, we have been able to start a school in India. A lot of our artisans have their kids in that school. We help support some schools in Haiti as well because obviously we believe in education and the power of education. It’s amazing how much a job and being able to take control of your own life and your own economic situation changes everything. And we have seen women become leaders in their own communities and just much more respected by men in general as well. It does give them a bit more power to be able to make good choices for themselves and for their families. Kenny: You know and I think that harkens back to one of the points you made earlier where charity certainly does have a place in this world. But the boost to a person’s self-esteem and self-worth that come from being able to provide for yourself and to be able to engage and make a difference in your life and to see the effect that it has on your loved ones… I just can’t imagine the heartbreak that people would feel—feeling like they are not fulfilling their role as a parent or as a family member. The thing that really touches me, as I have talked to you guys and heard about this story, is the self-fulfillment that a person would get from saying “hey, I’m not just looking for handouts, I’m looking for a way to better my situation.” it is not that these people don’t want to work or aren’t talented but there are so many unfortunate situations around the world. That is just amazing to me. I know I probably sound like I am just gushing but I just think this is such a cool thing that you guys have done. I’m curious how your consultants—I know you guys call them compassionate entrepreneurs—how it affects them to know that the products they are selling are making such a difference. Have you guys seen that? Especially where they’re also trying to improve their lives. I’m just, I’m very curious about the culture that it creates and the connections that it builds and maybe you could give me some insight into that. Elizabeth: Yeah, it’s been amazing because the purpose that our compassionate entrepreneurs have by empowering our artisan partners around the world, that purpose just lends to them feeling so much ownership over Trades of Hope and over their own Trades of Hope businesses. I think everyone has a desire to make the world a better place or at least to have some kind of purpose in life. And I know for a lot of women, it’s hard to feel like you are able to live out your world-bettering purpose when you have kids, or you have another job, or you maybe woke up one day and you are not really sure how your life got to where it’s at and you are realizing you are not contributing to the world in a way that you had always hoped for. So it’s been exciting to see our compassionate entrepreneurs just come alive by finding a purpose and a way to make the world better but without having to sacrifice time with their children, without having to sacrifice just their presence in their home, and some are doing it without even sacrificing their daily jobs. I know that as a child, having done so much nonprofit work on the ground in Haiti… it’s hard to come back to your normal day-to-day life after knowing the reality that is occurring around the world. And it can lend to someone feeling really torn and really unsettled and confused because you have a life and a family and responsibilities here in America, but then what can you do about the problems that you know about around the world? We have just seen them reach for their own dreams. That’s a big reason why Trades of Hope is so awesome and fun and joyful. Our compassionate entrepreneurs are reaching for their dreams as our artisan partners are reaching for theirs and it creates a beautiful dignified partnership between compassionate entrepreneur and artisan. Kenny: Wow, that is just amazing. So, how many countries do you have artisan partners in? And do you have—I know I’m kind of asking you to come up with stats just off the top of your head—but if you could give us some insight into the number of countries that you guys are working with and the number of people. Gretchen: Well, the easiest answer is we work with about 15 different countries and 29 different artisan groups. At times, we pull in some special Christmas ornaments from Vietnam or you know some things left over right? we always have at least 15 the past few years. So, do you remember the number of consultants Elizabeth, I mean artisans? Elizabeth: Yeah in 2016 we helped employ over 13,000 artisans around the world and then we found out that—just through some more digging and question asking and inquiring with our artisan groups—we found out that because those 13,000 people were employed, 42,000 people were positively affected because women usually will reinvest in their families and communities, 90% of what they earn. And usually, statistically, when a woman rises out of poverty, she brings about 4 more people from her family or community with her. So, in 2016, over 42,000 people were affected by the work that Trades of Hope is doing. Kenny: Wow, that is really incredible. I know that I’ve taken quite a bit of your time this morning and I want to be courteous to that. But, you know one of the things that we have seen in the US… just as a little bit of digression and a little bit of background: so, I have grown up my entire life within this industry and been around many, many different companies and I’ve seen the good and the bad. I have also seen a lot of outside attacks on the industry. One of the things that I find fascinating is that you guys came on to the network marketing scene really to fulfill a need of trying to lift people out of poverty. I’d be curious to get your feedback as people who really are coming at the industry from the outside and now have been working for many years within the industry. What are some of the positives or what is some of the feedback that you guys have about the network marketing industry and some of the things that it’s has allowed you guys and allowed your compassionate entrepreneurs to achieve? Gretchen: Well, we just had a big event in Nashville, our annual event. One of the talks that I gave there was just basically how we are completely head over heels in love with the industry itself. You know we were in love with Trades of Hope for a long time, but the more we have learned, and the journey that we have been on, and the more people that we have come into contact with… it’s just shown what a supportive, positive environment that the industry is all on its own really. We went to DSA for the first time thinking that it would be you know kind of cutthroat and competitive and everyone was open and friendly and supportive and CEOs go out of their way to support other CEOs and it just is an amazing family, loving environment actually. Within Trades of Hope, I’m just so blown away. We really didn’t anticipate or even really get to think about the power of the sisterhood. Our culture within Trades of Hope is very uplifting and positive and celebratory. I mean where else in the world can you go start your own business and you get all of that, right? Most of the time you are kind of like an island. But the sisterhood… and seeing 500 compassionate entrepreneurs last weekend come together. It’s like a big family reunion. They are just so supportive of helping each other build their businesses in practical and just emotionally supportive ways as well. I mean I just don’t know where else in the world you would get something so powerful. Kenny: You know, like I said, I declared my bias beforehand. I have been around the industry my entire life but I do like hearing and letting our listeners hear different people’s perspective. So often we hear about the negative but it is true, there’s a community there and there’s an opportunity that is unlike any others. You guys have taken that and really done something unique and done something powerful with it. I want to touch on one thing you said which is in the direct selling space, it really is impressive because it is not so cutthroat and I think a lot of that comes down to the fact that it really is a means of distributing product and most of the products don’t actually compete one with another, so it does create kind of a unity. I can be selling wellness items and feel very good about supporting Trades of Hope who is providing products that aren’t directly competing with mine. With that in mind, tell our listeners how they can go learn more about what you guys are doing. Elizabeth: Yeah, so all of our information is at tradesofhope.com and there is lots of information about of course our artisans, all of our products, but then of course, there is information about what life is like as a compassionate entrepreneur and how being a part of Trades of Hope that is in the direct sales industry, how it can be so uplifting and so encouraging and really just complimentary to your life. Where else can you start a business that fits into your life rather than replacing it completely? And then of course, where do you get thousands of other people who are in the same boat as you at the same time? So, very exciting, very encouraging. And there’s also information about hosting parties whether they are in home or online and yeah, we are really excited about it and there are a lot of ways either by shopping, hosting or joining for everyone to get involved at whatever level they are excited to be involved. Kenny: Well, perfect, that is exactly what I wanted to hit on. Because, I do think there’s a place for everybody to go out and see what you guys are doing and you know we all kind of rise together in this industry as we support one another. Elizabeth and Gretchen, I want to thank you so much for your time this morning, but also for the wonderful work you guys are doing in promoting good around the world and so thank you so much. Gretchen: Well, thanks for having us and thank you for being so supportive of the idea. It’s good encouragement for us as well. Kenny: Well great, we look forward to watching as Trades of Hope continues to improve the world and we hope to have you on the podcast again soon. Gretchen: Alright thank you so much. Kenny: That’s it for today’s episode. We hope you enjoyed listening. We would love to get your feedback and hope you will rate us on iTunes or wherever you get your podcasts. We want to give a special thank you to Gretchen and Elizabeth for their time this morning and also a thank you to Adam Holdaway and Jana Bangerter for production support. I’m your host, Kenny Rawlins, and hope you will join us next time. How can I become partner? I am in Nigeria.